Despite the fact that he may have starred in the highest grossing film to date, Avatar star Sam Worthington really hasn't turned in a a truly great performance. Perhaps standing on the edge of a tall building in New York will bring out his talent in Man on a Ledge, a new thriller from Ghosts of Cité Soleil documentary director Asger Leth. The film follows an ex-cop (Worthington) threatening to jump to his death from a Manhattan hotel rooftop, but the potential suicide might be a front for something bigger. Now we have the first teaser poster for the thriller which might give you vertigo or a nosebleed. See it below! 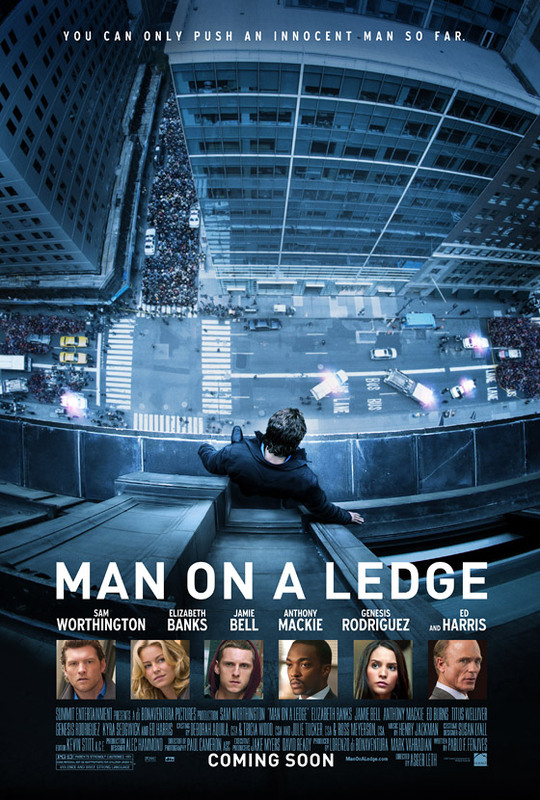 Man on a Ledge, the first feature film from director Asger Leth (Ghosts of Cité Soleil), follows an ex-cop (Sam Worthington) threatening to jump to his death from a Manhattan hotel rooftop, but the potential suicide might be a front for something bigger. Unbeknownst to the police psychologists brought in to talk him down, this suicide attempt is supposedly a cover for the biggest diamond heist ever attempted. Worthington will play the cop who was thrown in jail for a crime he didn't commit, but finds himself let out for his father's funeral. The film also stars Anthony Mackie, Jamie Bell, Kyra Sedwick, Ed Harris and Elizabeth Banks, and is slated to hit theaters on January 13th, 2012 next year. I like it. The Debt looks decent...Worthington may just surprise us. They're only the same in that they follow one man on a ledge. The detailed plot of each film is drastically different. does someone standing on a ledge really draw that much of a crowd? Maybe not that big a crowd. I absolutely loved "Ghost of Cite' Soleil", that was the most realistic, powerful documentary ever made! Asger is an incredible, talented filmmaker.